Now in her sixth year of coaching club and high school volleyball, Kristen Falcinelli joins Virginia Elite as an assistant coach of the 16’s team. She has previously coached at Maine Juniors Volleyball Club and is currently the assistant varsity coach at the Academy of the Holy Cross, where she specializes in setter training and strength and conditioning. Falcinelli brings over 12 years of experience playing as both a setter and opposite at the high school, club, and collegiate levels. 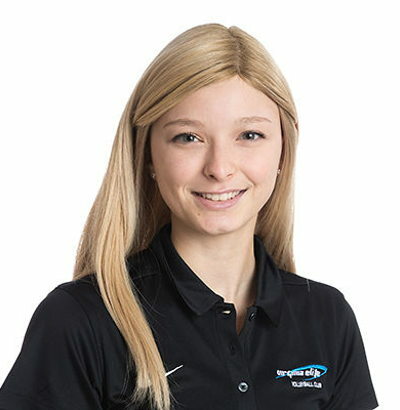 Originally from Silver Spring, Maryland, she played indoor for Maryland Juniors and Montgomery Village Sports Association, as well as beach for Evolution Volleyball Club. Falcinelli also played for four years at the Academy of the Holy Cross, where she was a member of the 2012 and 2013 WCAC championship teams and a WCAC All-Conference honoree. She then started for the University of New England for four years, during which time she received the Best All-Around Player Award, Coach’s Award, and Most Improved Player Award, and was named team captain her senior year. Falcinelli consistently lead the Nor’easters in assists, serve percentage, and digs, and lead the Commonwealth Coast Conference in aces. She finished third in career assists at UNE and was named to the CCC All-Conference Academic Team for three consecutive years. Falcinelli recently graduated with a B.S. in both Applied Mathematics and Marine Science and moved to the D.C. area from Biddeford, Maine. She now works as an oceanographic data specialist at NOAA in Silver Spring.